Hello stamping friends! Here are the projects that I created for this week’s Facebook live video. I went out shopping recently and found some fun Halloween treats so I wanted to share a few ideas to package them up. 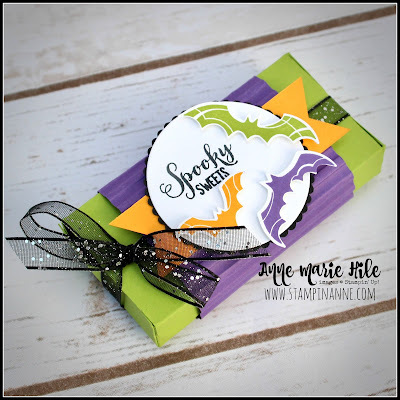 I went a little BATTY this week and all of my projects feature the Spooky Sweets bundle from the Stampin’ Up!® Holiday Catalog. 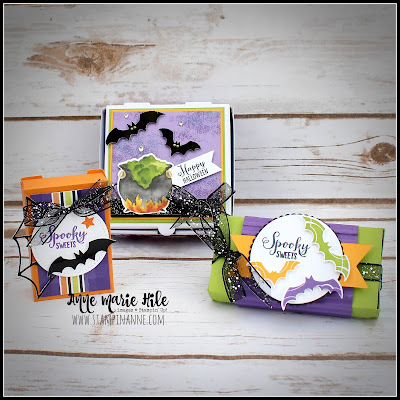 Halloween will be here soon, so it’s time to get those treats ready. I have a free PDF linked at the end of this post that shares all of the measurements and a full supply list for all of the projects. 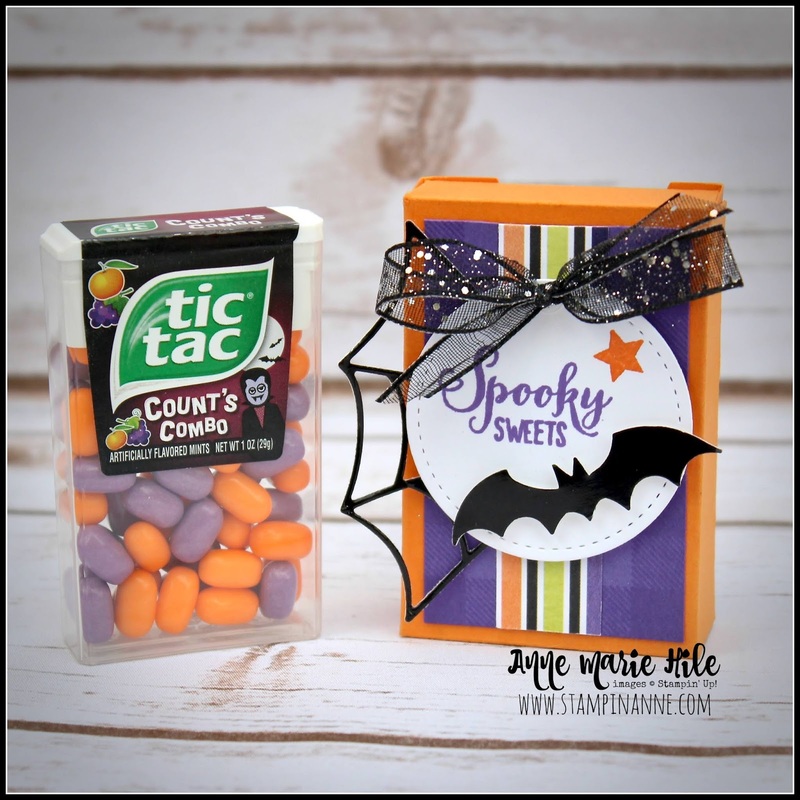 My first project was a little box, designed to fit these fun “Count’s Combo” Tic Tac's. I found them at Target with the Halloween candy. 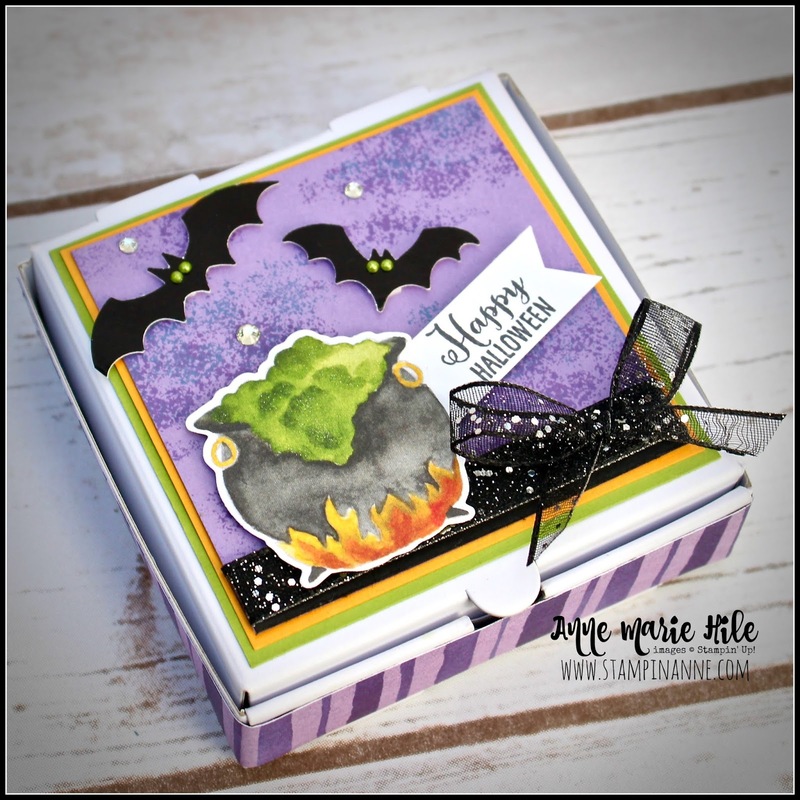 I just love that the colors match the Toil and Trouble Designer Series Paper perfectly. This box would also fit regular Tic Tac’s so you could always embellish the box differently for another occasion. Not all Halloween treats need to be sweet! 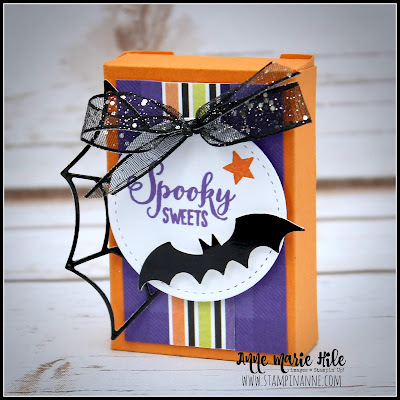 I wanted to make a project that included something without sugar and I love that Stampin’ Up!® has so many awesome options for gift packaging. The Mini Pizza Boxes are fantastic. They are easy to assemble, food safe (if you need them to be) and fun to decorate. I found two different things that would fit perfectly for my second project. 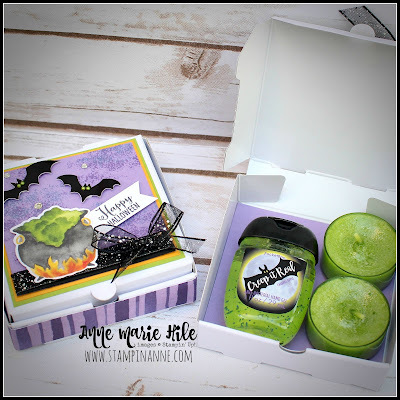 Yankee Candle has 2 fragrances for Halloween that are fantastic: Witches Brew and Forbidden Apple. These Pizza boxes hold four scented tea light candles perfectly. You can actually fit 4 scented tea light candles or 2 hand sanitizers or (what I did) a mix of both. Wouldn’t that be a fun gift for friends, teachers, co-workers…basically anyone. Ha! One thing I forgot to mention in the video was that I added a little Wink of Stella Glitter Brush to some of the “bubbles” in the cauldron. It’s hard to see in the photos, but it really adds a fun, extra touch. 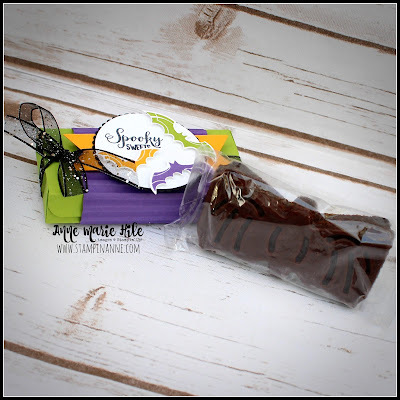 My third project was a cute little box that I designed to fit a Little Debbie Bat Brownie. So cute, right? The measurements are in the PDF that is linked below. I picked these sweet treats up at Target and I also saw them at Walmart. If you go to the Little Debbie website, you can see where to find them in your area. All of the products I used to create the projects will be listed on the sheets, along with the measurements. Also, if you put in an order in my online store ($30 minimum, before tax and shipping) by Monday October 15th, 2018 at midnight, I will send you these three make and takes for free! You will receive all of the supplies to create the projects but it will NOT include any stamped images (per Stampin’ Up! policy) or the treats that are inside the projects. If your order is over $150 (before tax and shipping), please DO NOT use the Hostess Code, so that you can earn the Hostess Rewards. I will still send you the make and takes, along with an extra gift. Remember, orders must be placed by Monday October 15th, 2018 at midnight for these make and takes. Thanks for visiting today. Please leave a comment and say hello.